Japanese street artist RoamCouch was answering questions from a TV presenter in March 2017, in front of a mural that he was creating. 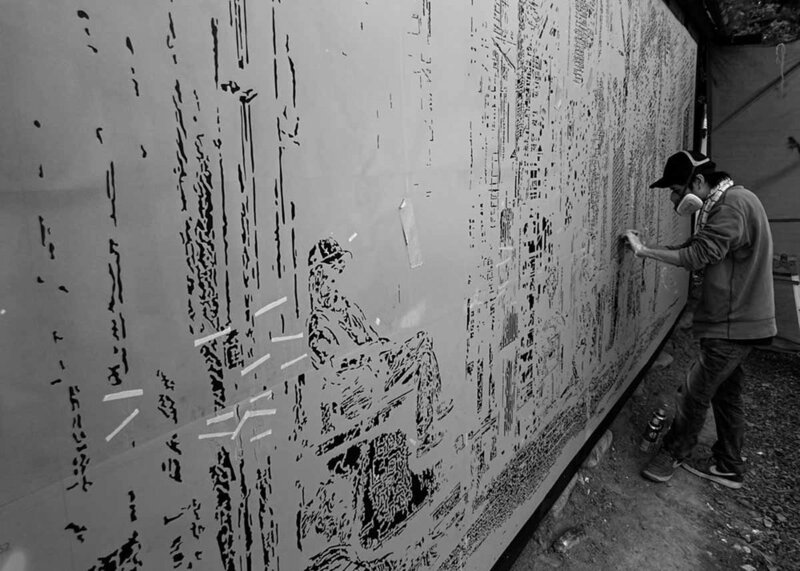 After the interview, he picked up his spray can and detailed hand-cut stencils to resume work. Some kids from a nearby gymnastics class, and their parents, stopped to observe him, curious about what was happening. After a few hours, he wrapped up the work entitled Four Seasons, which depicts beautiful Japanese women wearing kimono with seasonal flora including cherry blossoms, hydrangeas, maple leaves, and peonies. The breathtaking piece became the 11th mural in this project, and is located at OKB Gymnastics Arena, which is a facility to develop the skills of talented local gymnasts. In order to help revitalize his hometown of Gifu (see Gifu on the map), Ryo Ogawa, better known as RoamCouch, has been dropping impressive street pieces painted using hand-cut stencils. These are all part of the Emotional Bridge Project, which he has been working on since 2014 on the streets of Gifu. Although he is now widely recognized as one of the leading Japanese graffiti artists, his road to success was not an easy one. At the age of 18, he started working as a designer at a local company and due to the stress of long hours of hard work, he was diagnosed with a serious illness, leaving him emaciated and unable to stand up on his own. During his recovery, he began to rethink his life and career and subsequently made up his mind to become an artist. He styled himself RoamCouch to embody his wish of saving people by art based on a dream he had during his period of bedrest of a roaming couch that came to save him from suffering! In 2011, RoamCouch began his transition into life as a full-time artist. His exquisite wall stencil art and romantic style quickly gained popularity, and led to group exhibitions around the world, including the US, UK, Germany, Norway, Malaysia and Japan. In 2014, he opened his first solo show titled A Beautiful Life in New York and achieved the amazing feat of selling out the entire collection. More recently RoamCouch has begun to explore a style he terms Neo Ukiyo-e. He aims to produce Ukiyo-e of modern times by blending Japanese graffiti art with handmade paper - Mino Washi - created in Gifu (find out more about washi paper here, and you can read all about Ukiyoe in our Guide to Japanese Art). RoamCouch’s outstanding stenciling techniques have drawn much attention and snowballed in popularity. In fact, the intricacy of his stenciling sheets led some to speculate that they may have been cut by machine instead of by hand. He quickly dispelled this rumor however, by releasing a video of himself cutting the sheets by hand. RoamCouch was now vindicated as an artist with an astounding technique. His detailed stencil paintings redefined the stereotypical image of stencil art. In 2014, RoamCouch started the Emotional Bridge Project as a way to revitalize his hometown through public art. It all started when he noticed deserted shopping streets and realized that the town could be in decline. He explored ways to affect the situation and was determined to use his art to bring life back to the area he loves. His aim is to attract art fans to his hometown by publicly exhibiting his works. His first step to implement the project was to look for walls to paint his murals. 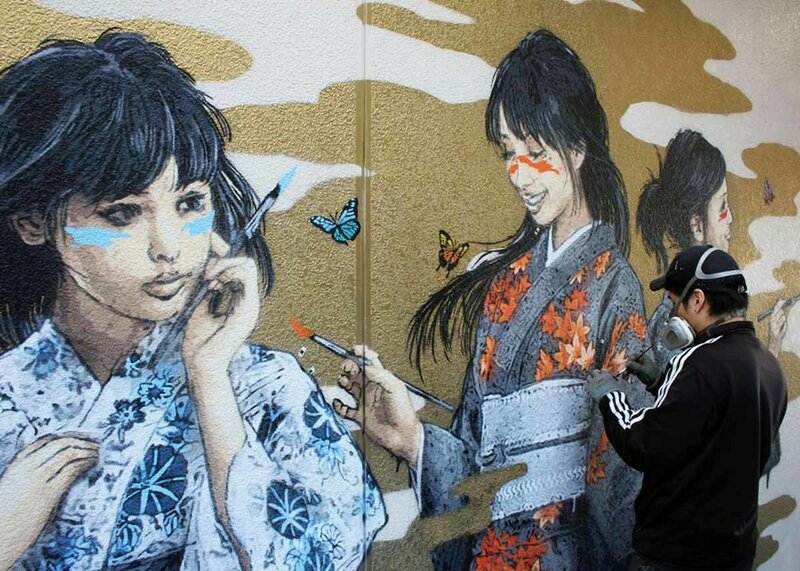 Japanese street art is not common in regional towns and is associated with illegal graffiti. Painting walls legally is not straightforward by any means. Aware of the difficulty, RoamCouch scouted possible walls to paint, then tried to negotiate with building owners. As expected, they were skeptical of his story at first, yet once they could see the rough sketches for the murals, they were usually very pleased to permit him to paint their walls. His works of art have something special to make people smile and create positive energy for everyone. The network of support for the Emotional Bridge Project has been expanding since 2014. His art fans outside Gifu prefecture and even outside Japan have gradually begun to visit the town to enjoy his work, and in 2017 his efforts were broadcast by NHK (Japan Broadcasting Corporation) nationwide. The Emotional Bridge Project has expanded opportunities for local people, especially kids, to be exposed to art. Children living in rural areas rarely have the chance to appreciate real works of art, especially alternative art or street art. In response RoamCouch spent three days working on a mural at his own former elementary school, entitled We Are the World. Many of the students visited his production site and his mural attracted various impassioned reactions. It would be the first experience for most of them to see the creative process and works of art by a real artist. What they saw had the ability to trigger a life-long interest in art. It would be the best and most authentic artistic education in their daily experience. The Emotional Bridge Project provides a platform to strengthen the bond of the local community. RoamCouch completed a mural entitled Midnight Recital inside a local shrine, which is one of the hardest places to paint a mural. It was necessary for him to obtain consent from the local people before embarking on the work: a briefing session was organized by one of the monks who managed the shrine to explain the concept of his project to the local people. RoamCouch had originally envisaged to create a wall painting of Nadeshiko (the personification of an idealized Japanese woman), but the community considered it inappropriate in a sacred area due to its sexual nature. 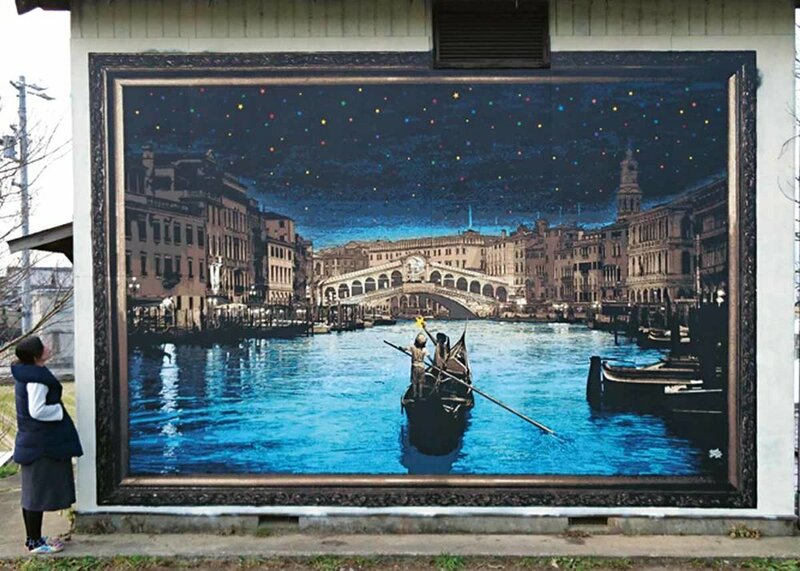 By changing in the mural to Midnight Recital, his project garnered complete support from the locals. In spite of the fact that it took a lot of time and effort to finish the mural, the process allowed the local community to get together, exchange opinions and make final decisions throughout the project. In these days, when bonds in local communities seem to be weakening, the Emotional Bridge Project can help people to realize again the importance of the emotional connection with others. In November 2018, RoamCouch completed his 13th mural entitled Take My Heart. 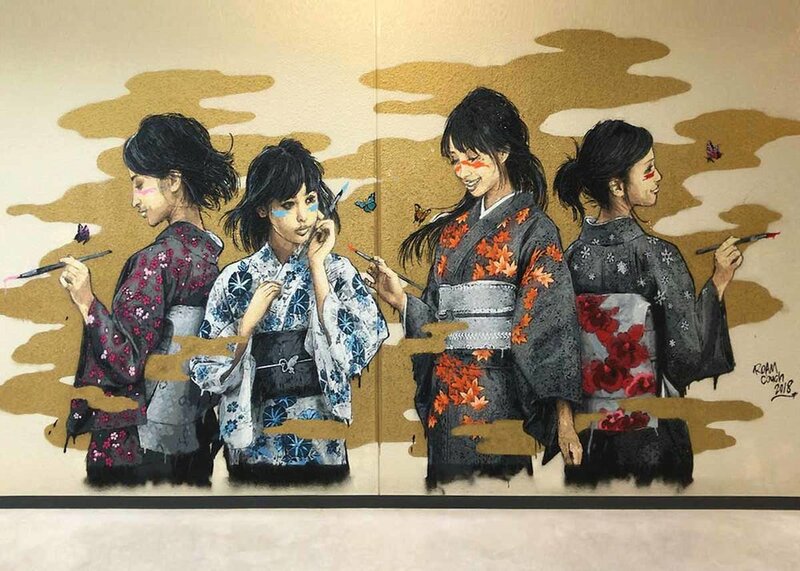 Every time he paints a new mural he draws attention from various Japanese media outlets, and his graffiti art attract visitors from all over Japan. In addition, his project is becoming a bridge between art and children to serve the educational needs of locals and strengthen emotional connections between people in his community. RoamCouch, who was saved by art is now trying to save people and his community in the same way. His journey has just begun. Daisuke Shirai is a writer for StreetArtNewsJapan. Originally from Aichi, he picked up a love for street art in Canada. He wrote and published RoamCouch’s first book, Fool’s Gold, and has an online art gallery at Jet Black Gallery.